The Flipside of Realism: Analysing the attraction of comedic representations of gangster culture in contemporary South Korean cinema. This provides a valuable insight into the holiday/business relationship surrounding this genre, and it seems akin to the business model behind Lunar Year comedies in Hong Kong, or horror movies released in the West to coincide with Halloween. Yet despite the obvious conclusion that a holiday season will bring in more ticket sales through there being a more available audience, I feel that for a film to be successful there has to be a deeper connection with the audience beyond availability. After all, if a film fails to deliver what the audience wants, then surely it would fail at the box office regardless of what time of the year it was released? Could the answer be found in Korean celebrity culture? There's certainly a case for big name Korean actors and actresses being a main draw for audiences, but on quick analysis it becomes apparent that it tends to be the gangster comedies that brought these stars into the spotlight in the first place. No.3 is a perfect example of this, which made stars out of Song Kang-Ho and Choi Min-Sik, both of whom could now be seen internationally as figureheads of contemporary Korean cinema. According to Jinhee Choi, in Korea these comedies are referred to as Sammai, which originates from the Japanese Kabuki Theatre term Sammaine, or third-tier actor. The Korean usage of the word, applied to film, can be seen as meaning 'cheap'; so with this in mind, we can establish gangster comedy as mid-budget films made with little-known, cheap actors that are released on certain holidays. Whilst this certainly improves the chances of a generous profit being made, it doesn't provide an answer to why they generate such large profits and, in some cases, create successful franchises. Which really only leaves two aspects that could hopefully provide an answer, and they both have to do with the content of the film itself – narrative, and characters. Comedic narratives tend to be fairly nondescript and for the most part generic, relying heavily on set-pieces and cultural/film-orientated nods or references to carry the majority of the film. Whilst this can prove successful initially, lack of progression breeds familiarity, leading to falling audience numbers – especially in franchise comedies. So that leaves us with the characters that exist in these films, and whilst undoubtedly comedies tend to feature basic stock personalities – cops, gangsters, slacker students – I think that it is because of the characters that these comedies are successful. If that is the case, then why does a comedic representation of gangsters equate to high profit margins and cultural acceptance? I feel that it's human nature to distort perceptions of things we fear to help us cope with them. Therefore, it's certainly possible that in castrating the masculine aspects of gangster culture, either through male-orientated comedy or by placing the concepts in a female body with franchises such as My Wife is a Gangster (2001-2006), it allows society to escape from the realistic threat that gangster society potentially poses. After all, films are considered by many to be a means of escapism, and gangster comedies provide the opportunity to laugh at a representation of something threatening, and it allows this to be done anonymously, in a cinema theatre full of people doing the same – with no repercussions for doing so. 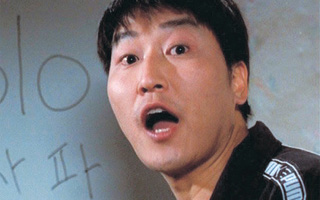 Films also are used to convey messages about society; No.3 is quite famously seen as a criticism on the vast majority of South Korean society, not just gangster culture. This also extends to the majority of gangster comedies, but it's not surprising to see that a lot of their messages coincide with the gritty, realistic gangster films – it's just that with comedies the chances of characters changing their ways and being forgiven is more likely. You'd be hard-pressed to find a gangster comedy that ever glorifies the gangster lifestyle; instead characters are portrayed as either lazy or stupid, and in many cases these two "qualities" are combined. The film will then present the gangster lifestyle as the wrong way to live, and chances are the wannabe gangster will either end up falling for a girl and changing his ways, or decide to become a respectable member of society and, you guessed it, change his ways. Such endings are not usually allowed or offered to characters in realistic gangster films; to let the character get away without being caught or killed is generally seen as a morally corrupt ending, as it could inspire imitators. This provides another possible reason for the popularity of light-hearted gangster comedy – it provides the gangster film experience but without any (or not as much) of the realistic violence, hard-to-watch scenes and dark or disturbing subject matter. Instead these comedies provide light-relief scenarios to usually intense, exhausting characters. 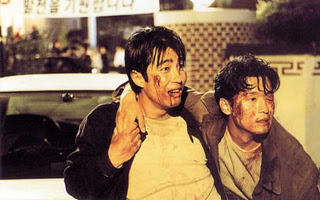 Films that provide a humorous outlook on stereotypical characters tend to draw a generous audience, and South Korean cinemagoers in particular seem drawn to the gangster archetype. Not that gangster comedies are ever aggressively mocking gangster culture, in fact it's only really a variation on the "dumb criminal" archetype you see in films all over the world. You only have to look at the child-versus-criminal comedy of Home Alone (1990) or the black-humour that fleshes out Guy Ritchie films such as Lock, Stock and Two Smoking Barrels (1998) to notice that not only is it a stereotype that can be found anywhere, but it's a stereotype that (judging by box office) audiences seem to respond to well. Not that this should undermine the success of South Korean gangster comedies, as they have undoubtedly created a successful business model rarely seen with other reference-based comedy. It's almost an obvious statement to make, but without the incredible rise in popularity of the gangster genre in the 90s these comedy offshoots would not exist – it's the fate of anything that achieves a popular cultural status to be parodied. Ultimately, despite all that marketing and release dates try to help, for films to be successful they need to provide something that the audience is looking for. It’s clear that gangster comedies, in which characters provide not only laughs but also ease social fears, fulfill those needs. Connor McMorran currently lives in Scotland, and has been a fan of Asian Cinema since stumbling across a late night screening of Hideo Nakata’s Ring on TV in 2002. He has just this year received his Bachelor’s Degree in Film Studies, currently reviews films at his blog Rainy Day, and is hoping to enter further education next year.